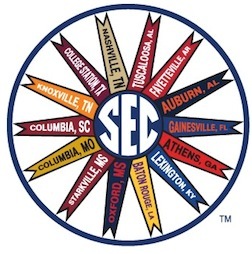 Southeastern Conference alumni from all 14 schools and their families and friends are invited to the 21st Annual Jersey Shore SEC Kickoff on Saturday, August 10 at Bar Anticipation , which is within walking distance from the New Jersey Transit station in Belmar. The cost is $5 and includes all-you-can eat BBQ and drink specials for the whole family. Entertainment includes a DJ, a volleyball game pitting SEC East alumni vs. SEC West alumni, a school cheering contest and much more. The event will take place, rain or shine. Click here to RSVP for the event on Facebook for go to JerseyShoreSECKickoff.com for updated information. For more information, contact Robert “Bing” Crosby at (215) 412-9059 or gator.bing@verizon.net.